On September 27 2014, after 6 months of continuous operation since this winter’s extended below freezing weather, a field test was done on the 5 gallon filters 10a and 10b. The tests indicate that filter 10a did not work satisfactorily. In fact, the output of the five gallon filter 10a was hundreds of times worse than its input water, which came from the source which is water collected from the first flush diverter/settling barrel array. 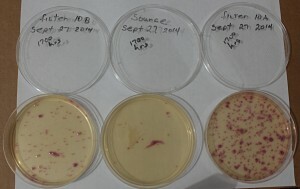 Filter 10b, which filters the output water from filter 10a, did show some additional removal of ecoli and coliform bacteria as compared to the output of filter 10a which appeared to actually add bacteria. But both filters’ output was far worse than the input from the source water. These results indicate that .25 mm sand is just too coarse to work in a shallow filter such as these 5 gallon subjects, and that .15 mm effective size sand just barely works, and may not work at all. These results also indicate that having more than one shallow filter is absolutely necessary for even marginal results, and that the water from the first must be fed into the second. This testing is after 6 months of operation. I will post images of the test results sometime today or tomorrow. The 55 gallon filter (filter 1) that has been running here for 8 years has output that is tens of thousands of times better than either one of these 5 gallon filters. It uses the same source water as the 5 gallon filters. It is important to note that these tests are only valid for this water here at this location. Water in a different area, such as a climate where the temperature is always way above freezing, will have different characteristics, and may very well be filterable by a 5 gallon filter. Water comes from the “source” goes into filter 10a, flows out (supposedly filtered) and then goes into filter 10b. The water out from 10b, the source water, and the water out from 10a are what was tested. The water out from 10b, is better than its input, so that filter is working somewhat. Filter 10a is not working, it is adding huge amounts of bacteria to the water. 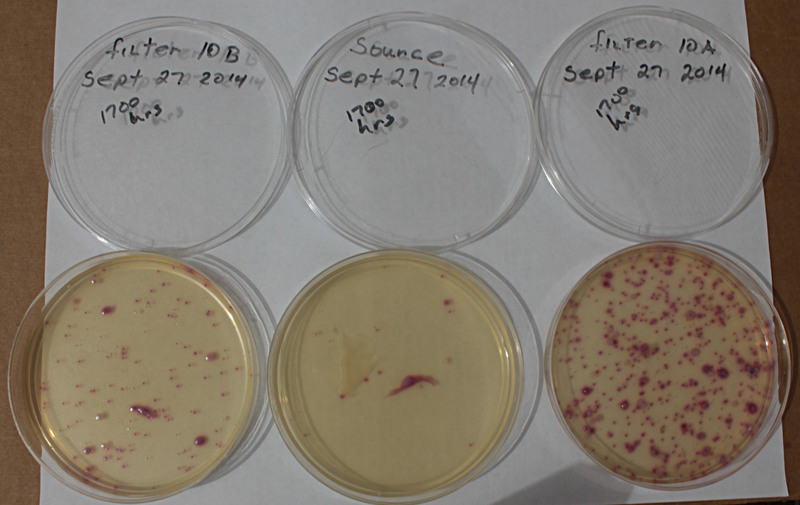 The red dots are coliform, and the blue dot in the filter 10a dish is e coli. The water coming from this filter, filter 10a, is highly toxic and not safe. The filter has been removed from any more testing and is no longer active. The sand has been discarded and the bucket and the sand have been sterilized. The bucket will be reused in a different setup. What might this test result indicate? 1. A 5 gallon filter using sand with an effective size of larger that .15 mm won’t adequately filter water at this location. 2. Water run through two 5 gallon filters (first one, then out of that and then into the next one ) is filtered better than just going through 1 filter. 3. Filter 10a obviously adds bacteria to the water. It is totally not working and is supplying toxic water output. That is the .25 mm effective size sand. It does not work. 4. Filter 10b filters that bad water from 10a and makes it better, but not good enough. 5. Contaminated water is slipping through the area between the sand and the inside of the bucket where the surface of the bucket was not adequately roughed up with sandpaper. 6. The sand in the bucket is not deep enough to catch all of the bacteria possibly because bacteria predation typically occurs deeper than just a few centimeters down from the top surface of the sand. As this happens over a long time period, in this case 6 months, the escaped bacteria simply build up in the lower regions of the sand. Know that there is only about 10 inches of sand in one of these filters. 7. Filter 10a uses an overflow pipe to allow the excess water added to the top bucket to flow into a reservoir bucket. That water is, occasionally, then poured back into the filter 10a input. It could be that bacteria is multiplying in that reservoir, and then overwhelming the 5 gallon filter. 9. The bucket used to transfer water to filter 10b could be inadvertently adding bacteria to the water. It could be that filter 10b is actually working quite well. Filter 10b uses .15 mm effective size sand. The flow rate is very, very, very slow. It may be that another filter with .15 mm effective size sand would adequately filter the water. In other words 3 filters in series may work. But, the sand size must be no larger than .15 mm effective size. That will mean an extremely slow flow rate. This entry was posted in rain water harvesing, slow sand water filter study and construction. Bookmark the permalink. Hi, very interesting site you have here. I read about filtering water with a sand filter before. Those filters where much taller and built in Africa. I was wondering if you have tried filtering the water through Diatomaceous Earth instead of sand. If not why not since they use DE for pool filters? Thank you! it does seem that some Diatomaceous Earth products are usually almost a powder. That would not work in a slow sand filter. If you could find some product that had grain size of between .35, and .15 mm effective size, and a uniformity coefficient of less than 2, it might work. It might be very expensive.